Looking to seize attention? Want to be noticed? That’s what was on the mind of University of South Florida student, Cesar Hernandez as he planned his marathon speech on campus this week. His plan? To deliver a Florida student speech for a full 24 hours on the campus and garner support for the students’ cries for support, rights and an end to immigration laws. Was he successful? He managed to keep his speech going for a full 24 hours. But he was a shadow of his immaculate self when he finally finished. He looked tired, felt tired and was indeed truly exhausted. That’s not surprising. But, just think about his poor audience as well. Because that’s why we advise you not to be a long-winded speaker. His speech was far from a tour de force, which is not surprising given its longevity. He began well with an introduction dedicated to him, his life story, his ideals and his thoughts. But he soon gravitated to reading from a weighty tome, A People’s History Of The United States, by Howard Zinn. His audience was receptive as he took to reading from his favourite book. That was a surprise. His book reading was perhaps the student equivalent of death by PowerPoint in the office. At least he’s readied himself for that task. With his 24 hour marathon student speech completed, Cesar Hernandez left his Red Bulls and coffees and headed off for some sleep. Sleepy, yes. But satisfied he had a listening audience even throughout the night. Now that’s an achievement for a student speaker. And not at all bad for a student speech. You can discover plenty of public speaking tips, all ready for your next speech. And, with more than 100 top tips for public speaking and presentations, there’s something for everyone. 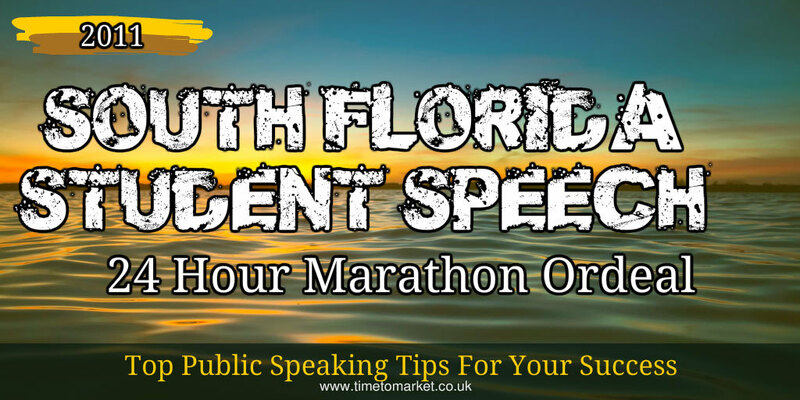 And, of course, don’t forget to look over the tip that asks, how long should your speech be? But when you want to maximise your own public speaking potential, then you’ll find that a training course is just the ticket. So, when the time is right, please don’t hesitate to get in touch. with so much coffee and red bull… how did he manage to go to the toilet?? ?